On the American Territory of Guam in the western Pacific, is Task Force Talon, the world’s only deployed and active THAAD battery site. This is the world’s newest missile defense capability that can intercept missiles in lower space and in the upper atmosphere with its extremely powerful, long range X-Band radar that defends U.S. soil and American citizens in Guam against North Korean ballistic missiles. Equally important, Task Force Talon projects U.S. strategic air power into Asia through B-52 bombers deployed at Anderson Air Force Base and a U.S. submarine navy port as well as the largest American fuel and munitions depot in the Pacific. Last month, the B-52 squadron from Guam was used in power projecting flights over the internationally disputed artificial Chinese islands in the South China Sea. This squadron has also flown over the DMZ in warning to North Korea in the past. Task Force Talon in Guam remains indispensable not only for American power projection, but also delivering extended deterrence for U.S. allies in the Asia Pacific region. The Delta 2 THAAD Battery of Task Force Talon and its 100 plus soldiers are currently on a twelve month rotation out of Fort Bliss, Texas. This battery shares the deployment cycle to Task Force Talon in Guam with three additional THAAD Batteries co-located at Fort Bliss. Earlier this month, Task Force Talon with its Delta 2 THAAD Battery flawlessly executed an air lift movement of 24 THAAD interceptors into Anderson AFB, proving both efficiency and rapid mobility in increasing capability to the system. Last month in the nearby Pacific Island of Wake, the United States demonstrated a tandem defense capability in the Pacific unmatched in the world today by successfully combining U.S. Aegis BMD and THAAD multi-layered defense in a live-fire exercise against both cruise and ballistic missiles. As part of the military shift to the Pacific ordered by President Obama, the military should deploy a second THAAD battery from Fort Bliss to Guam, create a new Army Air Defense Brigade, and provide additional Patriot Batteries in the Pacific. These critical elements are needed for strategic deterrence and reassurance, and to enhance the limited resources of our Pacific allies and ourselves. The Republic of Korea continues to debate the merits of deploying a THAAD system on its territory with an earliest possible deployment date of 2018 should they decide to proceed. This possibility, along with enhancing Japan’s security both in the southwest region and in mainland Japan with a expeditionary U.S. THAAD system out of Guam, would be of tremendous value in shaping the strategic environment in the Asia-Pacific region. The potential expeditionary THAAD battery in Guam parallels with increasing American, Japanese, and Korean Aegis BMD ship-based platforms and their mobility and flexibility going into the region. There is a expeditionary precedent set as the 1-1 ADA Patriot battalion in Okinawa, Japan is splitting its 4 firing batteries into 2 expeditionary batteries and two alert batteries to defend Kadena Air Force Base with the former having the capability to surge across the region. Today, the 1-1 ADA Patriot battalion, the two forward based AN/TPY-2 radars deployed in Japan, and the THAAD battery out of Guam do not have a direct Army ADA Brigade to support them and must rely on additional manpower from the 94th AAMDC in Hawaii and the 35th Brigade out of Korea. Due to the vital importance of this mission in Guam and the extended twelve month service that these young Army soldiers are committed to without their families and under General One orders, MDAA had the opportunity to honor and recognize the best of the best in excellence of leadership and performance for their ten months of forward deployment this year. 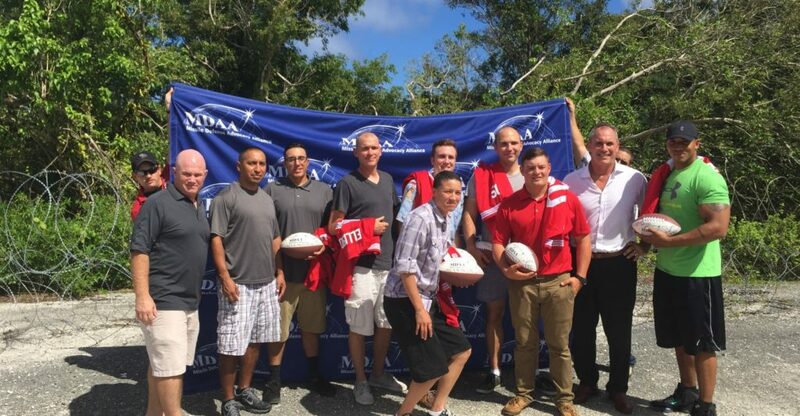 We were honored to hold the first ever Guam Defender of the Year Fiesta event outside under make shift tents with local food the day after Thanksgiving to honor the soldiers and give them our thanks for making our nation safer.